Monique Griffith Designs: Guest Designer, Wendy Lawrence - and Blog Candy AGAIN!!! Guest Designer, Wendy Lawrence - and Blog Candy AGAIN!!! Introducing my very first Guest Designer, Wendy Lawrence!! The name may sound familiar to you, and you've no doubt seen her in many of my pictures from CHA. You've probably even met her if you've been to a class of mine. Wendy is my best friend, amazingly devoted assistant, and a brilliant designer. She's incredible with altered projects, and loves to distress and bling things out. Check out this fabulous project that she has created just to share with you today. Nice! You can see more pictures on her blog HERE, so please pop over and check it out. 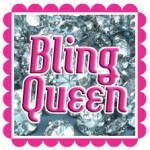 Her blog is fairly new, but we are going to be beefing up the Bling Queen's site with many more projects to come. "First off-I love to alter items. This was a Bare Elements-Maria Purse-Half Moon (made by Creative Imaginations). I covered the purse with the New Websters Paper Line "Life's Portrait" and distressed it with Tim Holtz "Black Soot" distressing ink. And all the cuts were made with my bug using "Forever Young" cartridge. 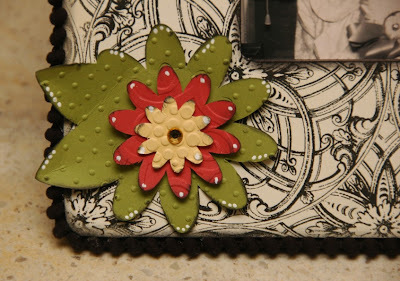 A few of the items were embossed using my Cuttlebug and various folders then pop dotted. And to put the final touch on this I used the black cord ribbon purchased at Jo-Ann's. The frame was covered the same way also used the distressing and cording. (The frame was just $1.00.) The flowers were embossed and pop dotted to give it a little more definition." So, how CUTE is Wendy's project??? Oh, I want to steal it when she's not looking!! Here's how to enter for the blog candy today. Leave a comment here and let me know what you think of my lovely Guest Designer. Be sure to become a follower of my blog, and leave your email address or at least your messageboard name in your comment so I can contact you if you win. And for another chance, you can leave a comment on Wendy's blog, and do the same thing. The blog candy is a Cricut Project Kit. You'll get your choice between the Warm Hearts kit (uses A Child's Year) OR the Christmas Morning kit (uses Joys of the Season + a font). You can see and click on the pictures at the top of my blog in the slide show. I'll draw the winner on Monday morning, February 8th. Huge thanks to Wendy for your gorgeous project today!!! These designs are beautiful. Wendy is very talented! I love love love it! and I adore wendy! I am headed over to her blog now! Wendy - you did an incredible job! Love that girly stuff!! Congratulations on being the Guest Designer! Wow Wendy, I love that little purse.. too cute. love the project very talented designer. Love the little purse, so cute. Wendy did a great job. Already a follower. Heading to Wendy's blog now. They are soo cute, I love the picture frame! they both are adorable. I had no doubt about her creativity, I hope this is the first of many designs from her. Very pretty frame and very cute purse. I think your guest designer is AMAZING!! Thanks for the chance to win. Love these 2 projects. The frame is so perfect for a pic I have. Thanks for the inspiration!!!!! 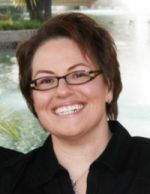 I love her projects - great ideas! I will starting a class at my daughters school soon and I'm thinking that the frame idea would be great for mothers day! What wonderful talent! Keep it coming. Such a cute frame! Your flower just grabbed me...I'm gonna have to scraplift this! And I love the purse! Absolutely stunning! I love what Wendy did in altering these items. I especially love the box. Love it! Very beautiful work! The little purse is sooo special!! I have a couple of grand daughters who would love it. The frame is lovely too. Thank you so much for sharing your beautiful work with all of us. Okay, love the purse. I need that Forever Young cartridge. My daughter would love all of those girly things. Great job Wendy! Wow, Wendy does gorgeous work!!! Monique I would be so honored to win one of your kits!!! Off to check out Wendy's blog! AWESOME!!!! Oh my goodness, those are beautiful! These projects are too cute! Absolutely love them! Wow...Wendy did a fab job. Love the projects! Just signed in for the first time. I am brand new to Cricut and looking for any and all the advice I can get to use it to the utmost. Well you know I love everything about you and Wendy!! Including you amazing talents. The purse is gorgeous!!! Love it and your blog too! I am now a follower! Great job Wendy! wendy, love both projects. the purse is absolutely gorgeous and I love the b/w pp you used for the frame. Great work! love the box too cute! Very Talented! Oh wow! her project are lovely. Wendy is very talented! I am on my way to her blog to check it out..tfs!!! O my GAWD this is fantastic!!!! i absolutely love it! wendy is a spectacular guest! Love the designs! Just beautiful! Wow, what a beautiful job. I love it. Thanks for sharing, Dallas. Beautiful Wendy! 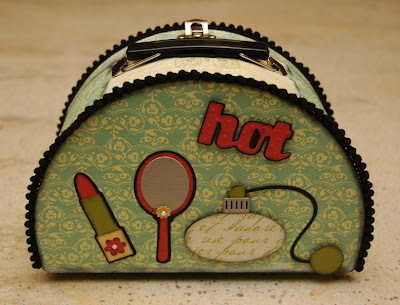 That little purse truly is "hot"! Love it! Very nice designs. Love to see what you come up with! That purse is so adorable! And the Frame is pretty awesome to! Wendy has alot of creativity. I would love to make one of those purses. Imagine what the two of you could do together, WOW! This is gorgeous! I love the paper and the black cording on the edges, it makes it look very classy. OMG those are GORGEOUS! I love love love those papers! wendy really brought her A game to this design project! WOW!! Birds of a feather...you two are amazaing designers!! Thanks for the adorable projects! Nice job. I'm not into altering, but she did good and I like her choice of papers. Thanks for the chance at blog candy!! What fabulous items!! 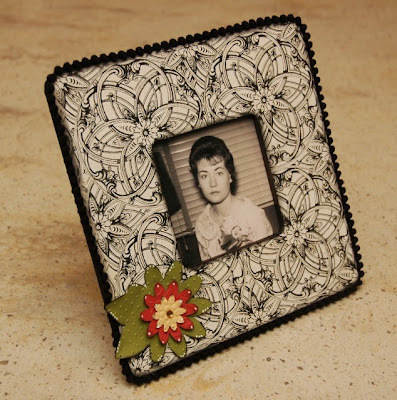 I am loving that frame and the black corded ribbon. Thanks for sharing!! Wow! 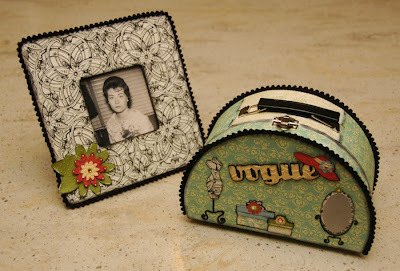 Love the purse and the picture frame. Tis amazing the talent that pours through here. Would love to make these. Thanks for sharing. Love it! Wendy this is such a nice project. Oh wow these are so beautiful I cannot even image making anything so gorgeous. I thought you had all the talent with your layouts but you had better watch out someone is creeping up on you lol. The projects are wonderful. Thanks for the inspiration. I checked out Wendy's blog and I love it. I'm a follower of both blogs now. Thanks for the inspiration. Fantabulous -- what cute ideas! I'd be so proud to win!!! Wendy -- your work is AWESOME! That is so beautiful! I am excited to see all of the fun that you and Wendy are having on your blogs! Oh my I love it!! Great work! so creative. SHUT THE FRONT DOOR!! Those are so gorgeous, Wendy!! WOW!! LOVE both projects! Also, really LOVE how you added so many cuts to the purse - super cute!! Wendy, you are awesome and it comes through in your beautiful creative designs. Love you! Love these projects!! I am always looking for altered items!! Very nice! WOW... I love all of your projects. You do a wonderful job, Wendy!! The designs are just fabulous!! Those projects are beautiful. Wendy did an awesome job! love it....wendy...just found your site.. WELCOME Wendy! What a great project. Going over to your blog to become a follower and leave a comment. Thanks for sharing. Wow, that is just stunning. I love that cord! She's set a high guest designer bar : ). buy generic cialis cialis daily dose effectiveness - cialis yorumlar?